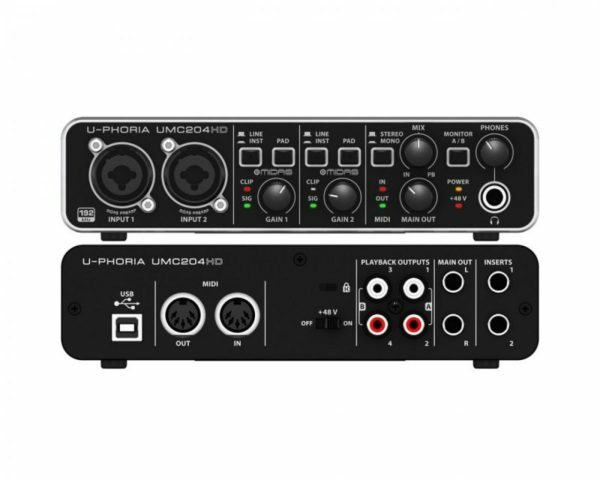 On the rear panel of the UMC204HD, you’ll find the USB 2.0 port for simple and easy connection to your computer, along with plenty of analog playback options including ¼” TRS, RCA and XLR. The UMC204HD also features 2 analog Inserts for use with external effects such as compressors, gates and EQs, etc. Built-in MIDI I/O allows you to connect keyboards and all your favorite outboard MIDI hardware. As our way of saying “Thank You”, when you register your UMC204HD at behringer.com, we’ll reward you with a complimentary download code for the full version of Tracktion. Recording and editing couldn’t be easier. To learn more about Tracktion, visit tracktion.com/support/videos. ∙ Compatible with popular recording software including Avid Pro Tools*, Ableton Live*, Steinberg Cubase*, etc. ∙ Analog Inserts for use of external effects such as compressors, etc.